For the orchestra’s part, musical selections accompanying the acrobatics included exciting performances of Falla’s Ritual Fire Dance, Wagner’s The Ride of the Valkyries, Elgar’s Enigma Variations, and Khachaturian’s Suite from Masquerade, all under the able baton of conductor, Robert Franz. 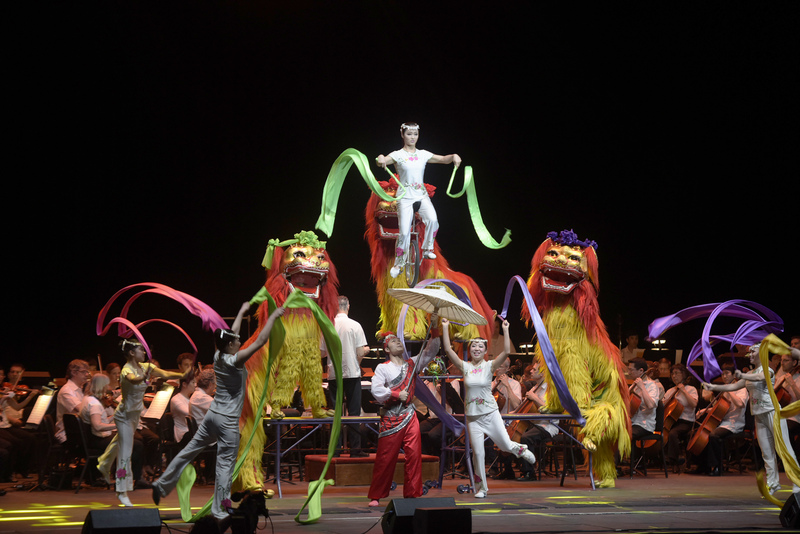 The music was splendid, but center stage on this night clearly belonged to the amazing Peking Acrobats. The atmosphere was clearly that of a grand circus, and while there were no real animals involved, the exotically costumed “lions” that performed the fantastic feats of the opening Lion Dance would dazzle the audience right out of the gate. A segment of the program called, “Squeeze Play,” was clowning at its best as two of the young men in the cast had the audience roaring with laughter while one of them repeatedly found extraordinary ways to squeeze himself in and out of a very small metal cylinder. There would be exotic oriental drumming for, The Sounds of Rolling Walnuts sequence, and mind-boggling balancing tricks during the Aerial Chiffon display. 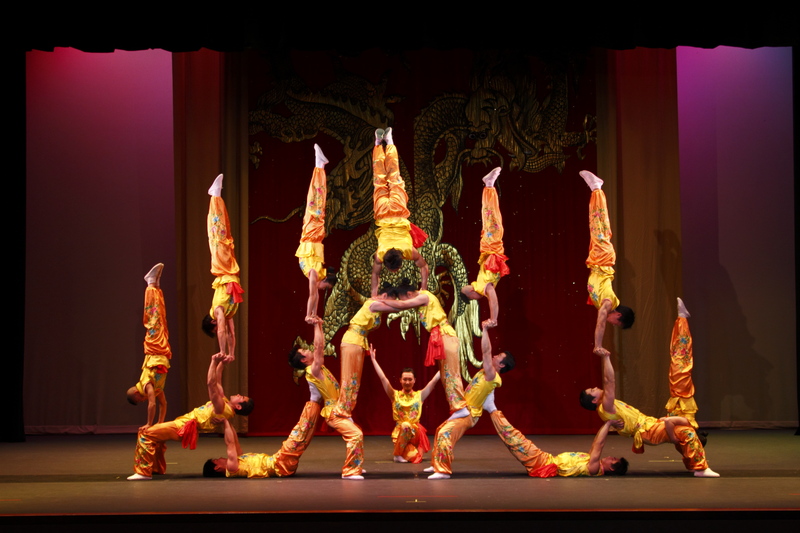 Closing Act I of the program was an incredible Kung Fu Ceremony delivered by a large group of young men who appeared to be at the peak of physical perfection and athletic prowess during the many acrobatic tricks they performed. Following intermission, another group of athletic male performers demonstrated the mysterious art of hoop diving in a segment titled Diving Derring-Do. The ladies quickly followed with more incredible balancing stunts during the Fantasia sequence. In The Bull and the Tiger segment that came next, two huge ceremonial drums were brought on stage and the two drummers could certainly have qualified for the Drummer’s Olympics. By the way, in addition to the full symphony orchestra, there was a separate smaller orchestra with this company that accompanied many parts of the program playing traditional Chinese instruments. Perhaps the most thrilling acrobatic demonstrations were three that capped the evening. A gentleman with amazing gifts of balance and strength performed the astounding In the High Chair segment that eventually had him high atop a huge stack of large wooden chairs and balancing himself upside down there on just one hand. It was actually frightening to watch as the audience collectively held its breath until roaring approval at the trick’s conclusion. Not to be outdone, five lovely young women followed that performance with a dramatic chair-stacking trick of their own that once again had the audience breathless. Then came the stunning finale of the Bicycle Pagoda and the Human Pyramid. 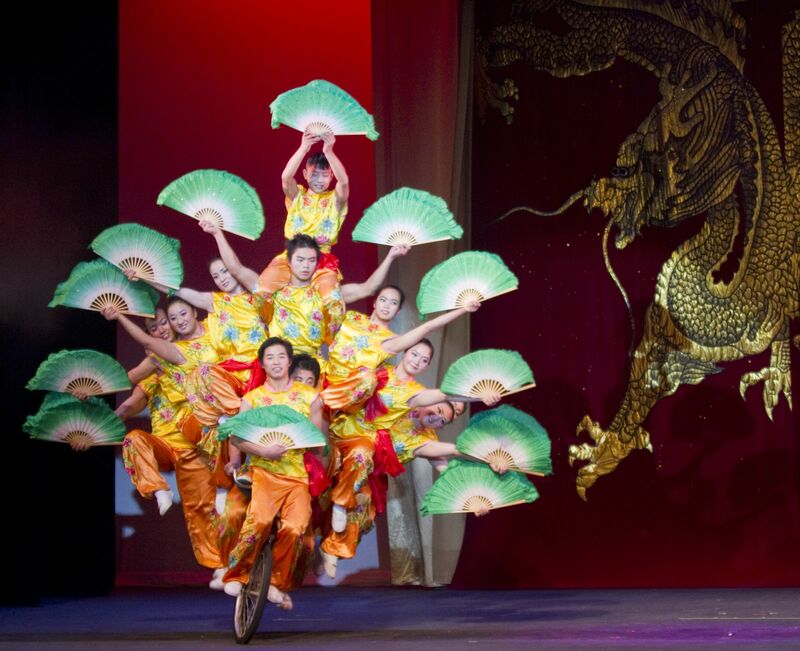 They say “seeing is believing,” but I’m still finding it hard to believe that I saw eleven acrobats, balanced on each other’s shoulders, while all on one bicycle riding around the stage! Allow me to use that most overworked word: AWESOME! This entry was posted in BroadwayStars.com, Classical Music, Concert Reviews, Conroe Courier, Elgar, Houston Community Newspapers online, Houston Symphony, Khachaturian, Peking Acrobats, The Courier Columns, ThePeoplesCritic.com, Wagner and tagged Classical Music, concerts, Cynthia Woods Mitchell Pavilion, Houston Symphony. Bookmark the permalink. As a long-time reader of your reviews,Mr.Bentley, I cannot recall one so favorable of a performance. I regret that I was out of town for this and will look forward to a return engagement. Please continue to keep us so well informed.